Huun-Huur-Tu are real natural musicians, “throat-singers” from Tuva, a Russian republic on the Mongolian border. These four channelers of nature, three string players and one percussionist all share in the over-tone singing, and make their own instruments igil, khomus, doshpuluur, tungur and others. This concert took place on a Saturday morning at the Children’s Amphitheater as part of the World City Art program, geared towards children. They only played 6 songs with vocal solos which lasted for about 25 mins and I had wished that it went on for about 2 ½ more hours. Their songs are in 4/4, 7/4, 10/4 and other meter types. There is never a “back beat” type of groove. One song about a horse was in 10/4 and you swear you were right there on the horses back. See nature doesn’t always move in 4/4. 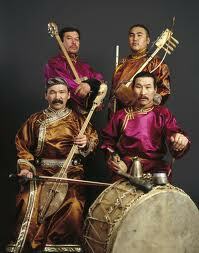 Tuvan are nomadic people and through their music they create sonic “maps” of their topography. By imitating or aesthetically representing the sounds of nature, human music-makers seek to link themselves to the beings and forces that most concern them: in the case of the Tuvans, domestic animals, the physical environment of mountains and grasslands, and the elemental energies of wind, water, and light. To sum it up here, they are just a different breed of musicians than in the Western sense. In this day and age, we can barely fathom the value of their expression. There are no egos apparent and how could there be? They are playing nature, not for bling, stardom but just to be with their land. So what does that teach us in 4/4 land here? How are we mimicking our environment? Stuck in mainly one 4/4 time zone? What does that say about this (Western) culture? Huun Huur Tu, has much to teach us. The are fascinating to watch and to listen to. They are an experience to be witnessed whether they wander through your town, iPod or computer screen don't miss them.